Subscribe or renew now to Racer X, the world’s leading source of motocross and supercross news, entertainment, and analysis. Never miss an issue! We will automatically renew your subscription for an additional 1 year at the same rate. We will always send you a reminder 30 days before your credit card is charged. If the card you provided cannot be processed, a bill will be sent. If you ever decide to stop your subscription, you can cancel at any time for a full refund on all un-mailed copies. Please send me the Racer X E-mail Newsletter and special offers and discounts by email from specially selected 3rd parties. Your order includes a FREE 3 month digital subscription for a friend! Please send a digital subscription to my friend. Your friend will receive a confirmation email with information on accessing their digital subscription. Allow 6-8 weeks for delivery of first issue. 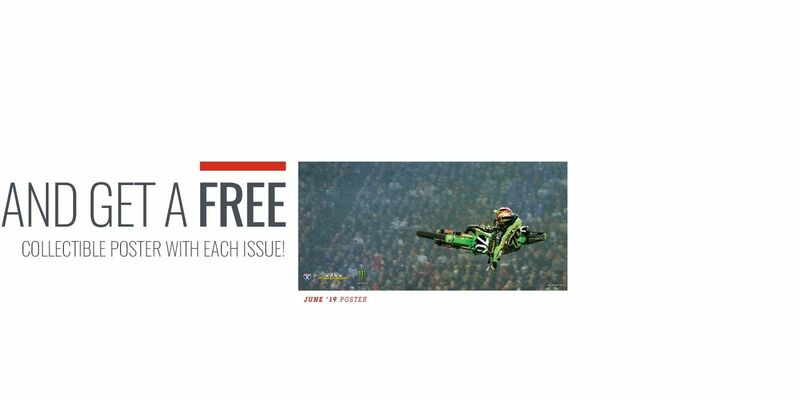 By subscribing to Racer X Illustrated, you are electing to auto-renew your subscription. This program will automatically renew your subscription each year for an additional 1 year (12 issues) at the same price until you choose to cancel this service. We will always send you a reminder 30 days before your card is charged. If the credit card you provided cannot be processed a bill will be sent. If you ever decide to stop your subscription you can cancel at any time for a full refund on all un-mailed copies. To cancel the auto-renewal service, please call (877) 684-0080, email us at racerx@pcspublink.com, or visit us online at racerxonline.com/pages/customer-care.